This summer the Washington post ran an article titled “U.S. Finds It’s Getting Crowded Out There: Dominance in Space Slips as Other Nations Step Up Efforts”. 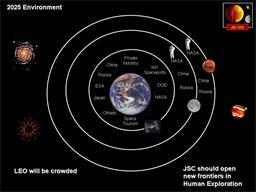 At first glance the article could be taken as a pessimistic view of the future for the Agency, but for me it is an affirmation of the strategy that Mike Coats, JSC Center Director, has been sharing with the JSC leadership for the past two years. During the summer of 2006 this image was generated to capture the perspective that LEO will be getting crowded and we could either choose to compete in a crowded LEO or lead the International team to explore beyond LEO. Mr. Coats decided that consistent with the Agency vision, we should begin focusing our sights on leading the integrated International team, comprised of both government and private industry to extend human presence beyond LEO. (Yes, I know Mars does not orbit the Earth, but the figure is trying to represent the idea that the next destination beyond the moon is Mars). Leading, we have found, is a tricky word. It carries so many different connotations with so many different communities. For JSC and NASA, leading the integrated International team is only possible if the leadership of each participant in the team is acknowledged. Two years ago Mike Coats encouraged each organization to reach out to the leaders across the space flight community and across industry to benchmark and where it made sense to partner with those organizations. He realized that capability will continue to grow outside of our gates and that humanity’s ability to reach beyond LEO lay in bringing together the acknowledged leaders in the various communities. His call for benchmarking and partnerships has led to strong collaborations with the Engineering leadership across the Agency and with the software development and simulation expertise at Ames, just to name a few. Acknowledging the leadership of each of the participants in the collaboration has made the collective team stronger. Recently JSC’s Space Life Sciences directorate acknowledged the leadership role that the Rice Business Alliance plays in spurring Innovation by providing seed money for proposals benefiting the human system. Leveraging the leadership of Rice’s Business Plan competition will in the end leverage the entrepeneurial spirit across a larger community. Ok, so what does this have to do with the growing space faring capability in the International community that is highlighted in the Washington Post article? I believe NASA’s current strengths address the future described in the article in three ways. First, the International Space Station has given this Agency the unique ability to collaborate and integrate the efforts of an international team. We have established relationships that we can continue to strengthen as the International community grows their Space Exploration capabilities. Because of these relationships we can celebrate the strengthening of the international team instead of bemoaning the fact that they are gaining capabilities as implied by the Washington post article. Secondly, there is a spirit of solution seekers that is permeating the Agency. Instead of always looking within, there is a growing emphasis to find the best solutions across the community, regardless if it is at another Center, commercial space or International. As one Senior JSC leader is fond of saying, “It is not either/or. It is AND.” It is not a case of the International community or NASA. It is not they lead or NASA leads. It is we lead by capitalizing on our collective strengths. Finally the Center and the Agency is focusing more and more on growing an environment and culture of innovation and collaboration. An organization that is continually innovating will continue to grow and adapt to the changing dynamics surrounding it. What do you think about the Washington Post article? Do you agree or disagree? If you agree, how can the Agency better position itself? The exploration of space is a human endeavor and NASA/JSC can best position itself for the future of manned space flight by encouraging and contributing to the international effort to explore space. We are stronger when we combine our efforts. Space is vast and there is plenty to go around, let’s get over our divisions and share the wealth and the knowledge. Bs… it&apos;s not as crowded as it should be.. I know that not many people at all is going to respond to this… And this is probably NOT the place to state this theory.. But I might have an expilination of a picture that NASA has posted on thier APOD website. The URL below is the picture I will try to explain. I think that when the meteor or comet strikes a planet while the planet is begening to form a thin layer of crust, the meteor, or comet, moves the crust away, making the apperence of a double ringed basin. As the crust moves outward, the other pieces of crust that was unaffected by the impact stoped the moving crust from going farther outward, there for the magma cools in the center of both rings, creating the smooth surface. I hope that someone will find this comment, and i hope that it will aid to new discoveries. IT IS IMPORTANT TO ME TO HAVE GOOD NEW SCIENCE INFORMATION AVAILABLE RIGHT AWAY. THANKS FOR POST THIS AND I WAITING FOR NEXT POST. Well I think China wants to dominate the “space race.” And I’m sure they have the resources to do it. And the post article is correct, Nasa has been kind of slumping. I certainly want the US to stay out in front. However, I worry that the way things are going economically, Congress won’t have enough funds for Nasa and we end up falling behind. I think that the other countries are trying to catch up with the United States. They don&apos;t have the resources to do it alone so that are combining resources with other nations. In the future, its going to get difficult for NASA to stay in front of the pack IMO. I certainly want the US to stay out in front. However, I worry that the way things are going economically, Congress won’t have enough funds for Nasa and we end up falling behind. I agree with the author its really getting crowded up in the space. It is very intresting to see where will it go from here. I agree with Kundan.. and like he said, with the state of the economy, what kind of effect will staying in front have on the country?? think that when the meteor or comet strikes a planet while the planet is begening to form a thin layer of crust, the meteor, or comet, moves the crust away, making the apperence of a double ringed basin. It is better if NASA and all other countries which has Space Program to be united. Yes, that&apos;s right. NASA and other countries should united so they can be more successful in researching the heavenly bodies. Can not image what will happen after 100 years later, NASA, earth and the world. Considerably, the article is in reality the greatest on this noteworthy topic. I agree with your conclusions and will eagerly look forward to your next updates. Saying thanks will not just be sufficient, for the wonderful clarity in your writing. I will immediately grab your rss feed to stay privy of any updates. Pleasant work and much success in your business dealings! Interesting article. How did you know? It wont affect our lives just yet? If you look at the rate with which economy of USA is growing VS the rate at which china, India, Brazil etc are growing, it becomes clear that in future these growing economies will spend more money in space exploration than the US. The best deal for USA would be to do joint space exploration in association with some of these countries. I think India and USA did a joint moon mission when they found water(moisture) on moon. Waht about ESA. And why not unite more counrties in such projects? I believe that there should be some sort of UN sponsored body to co-ordinate space activities for the benefit of all nations. There is only a chance to exploerer our universe, and that is, helping all together, regarding of nationality and skin colour. I really hope I see this happen. I am so happy that my new iphone 3GS model was able to run those few space apps like Uranus and iSky Gaze, also I saw that NASA Image of the Day app is free through apple store. Did anybody try this application? Is there any other way to install new apps ( ) then through iTunes? Would it not be better if all the countries joined together to create 1 big space agency, with the combined funds and intellect pool surely this would be better for everyone connected with space exploration? i have full faith in US Govt and NASA , they will definitely come up with a global plan as we already have a space global program even including russia. It is always better to be able to work together. I know I am better because of my partner. Thanks for the information, it was really useful. I was looking for it and I’ll be waiting for your next post. I do think that the next 30 years should see more collaboration between NASA nad the European Space Agency to cut costs and work towards genuinely identified viable projects. I agree with the Washington Post article. Well done! We need a lot more research to get to knowthings a lot quicker. It is taking too long! Interesting post. I don&apos;t know that I agree. How can it be getting crowded in space? I don&apos;t think there should be a race for taking space. Ohh.. I think that the other countries are trying to catch up with the United States. They don&apos;t have the resources to do it alone so that are combining resources with other nations. In the future, its going to get difficult for NASA to stay in front of the pack IMO. I don’t think this would going to happen….And how can space get crowded, Space has no limits. Congratulations for this interesting featured picture! A whole new world…! I think in 15 or 20 years it will be China that is “exploring” more space than anyone else and unless things change significantly with the relationship between the west and china there won&apos;t be a lot of sharing going on. Space has no limits, so what is the race all about?? Anyways, the article is interesting. Thanks for sharing it. No offense. I always interesting with space that unlimited so I just enjoy your post. However difficult it is, international cooperation is a prerequisite for a successful and peaceful space program, and the USA should maintain its leadership in this regard. If only we could make a , not a complete U turn, and think for once for the benefit of mankind. Local terrestrial origins are meaningless with respect to the conquest of the stars. This is how history is written, keep up the good work. I think it&apos;s great that other nations are pursuing outer space. Maybe this can help build a bridge between all nations as we work together on something common. Blockbuster made a great point. What is the race for? Since there is virtually no limit to space, there’s really no point in trying to race. I&apos;m all for collaborating with other countries of the world. We don&apos;t have to dominate everything…let&apos;s pool our resources and knowledge together for the benefit of everybody. I think that leading is the only way to go. But we dont have to be the sole leaders, it can be done as a partnership. In my opinion that would be the best way accomplish the goal. Collaborating with other countries of the world simply makes good sense. A collective think tank of all the world&apos;s minds using greater resources will speed up answers and problem solving. Everybody benefits! With the global financial crunch, it need not be a space race. The US, China and Russia can all pool resources to explore the world beyond our planet. They of course have to sort out the mutual suspicions first. Have you got any NASA applications or any NASA applications to keep track of missions etc? NASA has released a new iPhone app to help keep everyone up to date on what’s happening! You can download it for FREE on your iPhone/iPod Touch from the App Store or iTunes. Look for the NASA “meatball” and the title NASA app for iPhone. Just imagine what could be accomplished if nations would put self ambitions aside and worked together. I always like to read all post on space this is my favorite one,thanks for sharing it. Space is awesome. I wish I was space. Excellent post, thank you very much for taking the time to share with those who are starting on the subject astronomy. Greetings ! In the future, its going to get difficult for NASA to stay in front of the pack IMO. What a discussion, proud to be a part of it. I just downloaded the new NASA app for iphone and it is pretty impressive I have to say. Great news and great work guys.I really want to congratulate for your work.Keep posting us this type information.We really look forward to your post. This is such a great resource that you are providing and you give it away for free. I love seeing websites that understand the value of providing a quality resource for free. It is the old what goes around comes around routine. Did you acquired lots of links and I see lots of trackbacks?